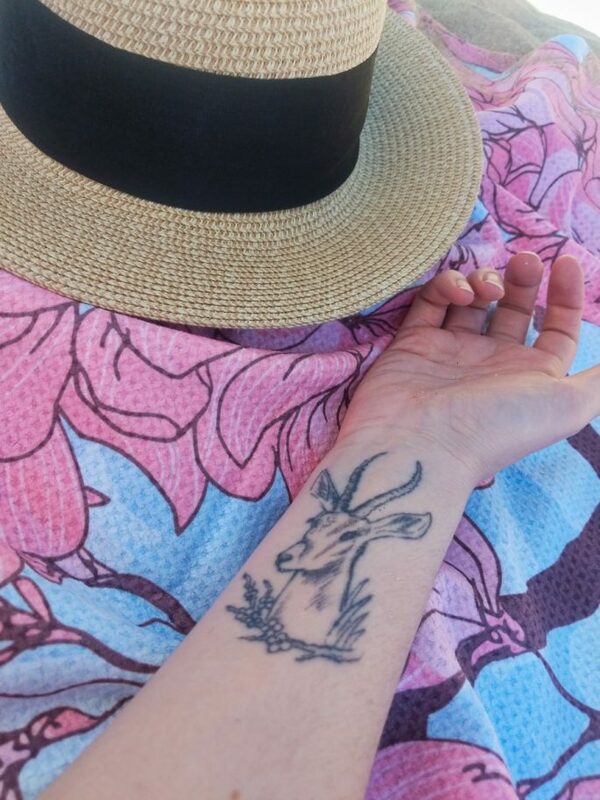 At the beach in Portugal and feeling fab. 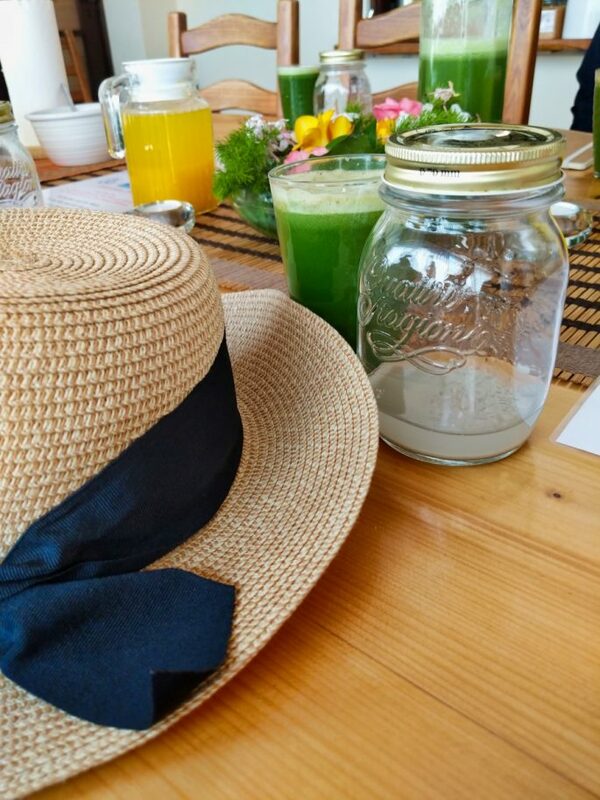 I’ve been warned that everyone talks (and fantasizes) about food the whole way through a juice retreat. Well I’ve got a head start on all the food talk because I live with a chef – and we think and talk about food non-stop. My partner is even opening his own food truck specialising in tacos and BBQ meats at the moment, and I’m the head taster. What I’d usually be eating. YUM! 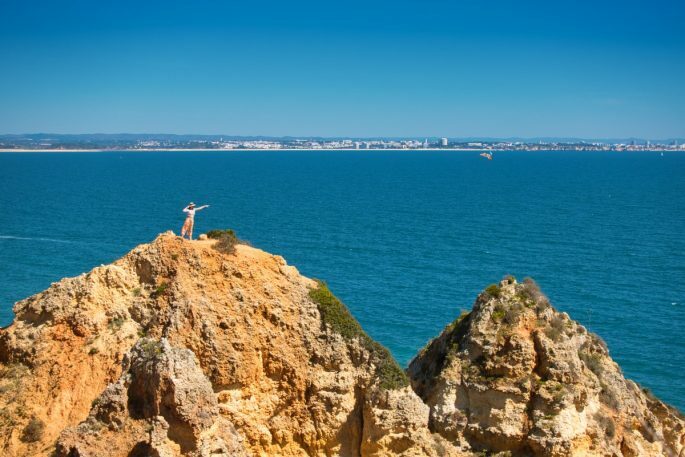 I find myself messaging friends on WhatsApp for most of the journey to Portugal’s Algarve to visit the Moinhos Velhos Juice Detox Retreat, and the main topic of conversation is also, you guessed it, yummy things. but for the first time ever I will put my food fixation to bed for a whole week, and swap my usual diet of TexMex treats for turnip juice. Yes, you can juice a turnip. Who knew? The food gets phased out sharpish on arrival at Moinhos Velhos; I arrive late at night and am offered a simple but tasty vegetable soup (without the best bit: the bread rolls) and there’s a bowl of apples for dessert. This will be the last solid food myself and my fellow dining companions will see for a week. I ask for seconds on the soup. 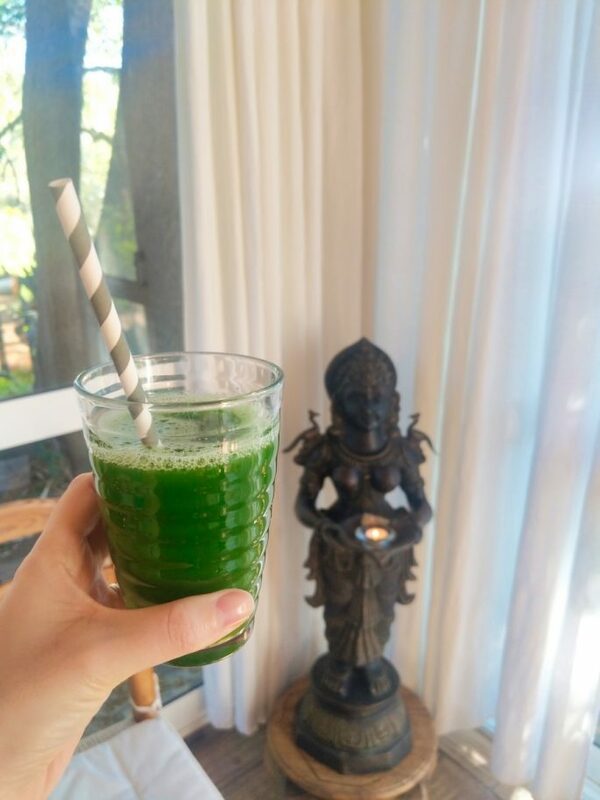 Day 2 of My Juice Retreat: Is It Tuesday Yet? 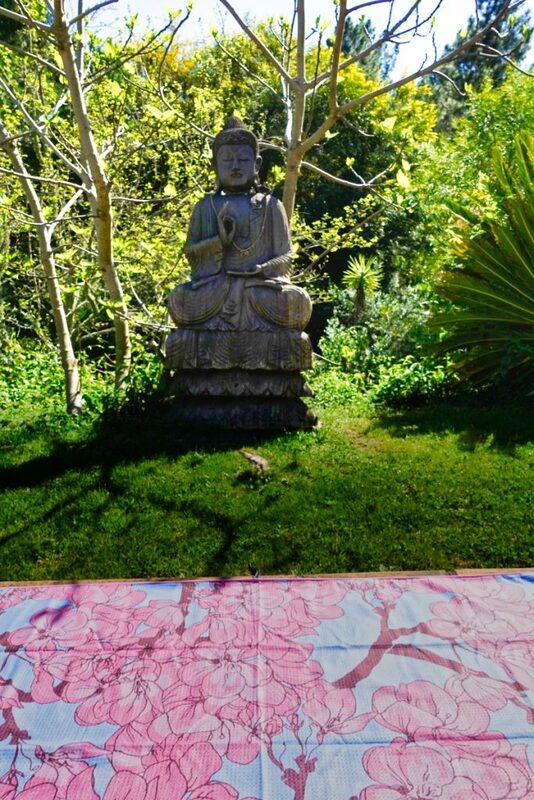 Day 7 of My Juice Retreat: What Did I Learn? 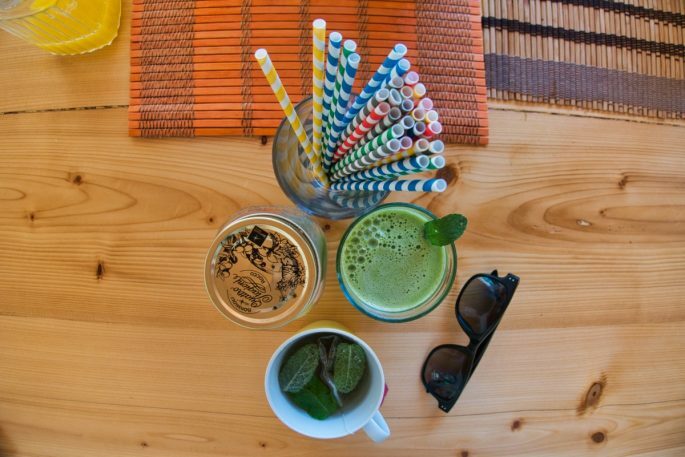 What To Eat After A Juice Detox? I’ve done myself a favour and cut down my food consumption about a week before the juice retreat. I may love eating but I know that if I keep tucking into meat, coffee and chocolate right up until departure, the only person I’ll be cheating will be myself. 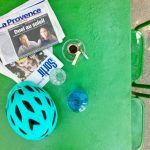 It isn’t easy to say no to my favourite foods but as the deprivation has a point to it, and is temporary, I don’t mind that much and it proves to be less difficult than I imagined. I phase out meat first and eat chicken or fish for dinner, then cut out bread, rice, couscous and other starchy foods, working up to eating a small piece of salmon with salad or steamed veg for the three main meals prior to leaving. I stop the coffee a few days beforehand too. I slip up and have a couple of packets of salt & vinegar crisps as they’re in the cupboard and calling my name. You see, this is the reason I can’t do a juice detox at home. I hear you go through lots of ups and downs during a detox, with extreme highs and lows which can leave you exhausted or full of energy, crying or laughing. Like most people I just assume this is what happens to others and that it won’t apply to me. I am wrong. 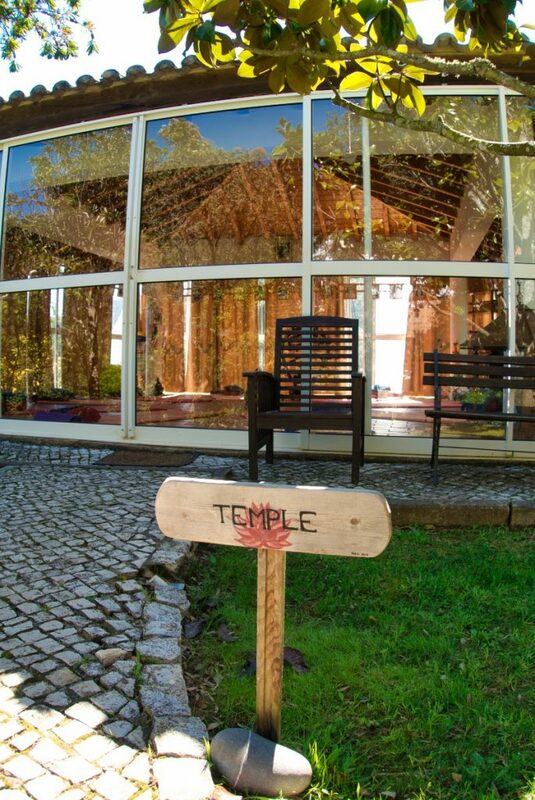 The first day of the juice retreat is all about firsts. Meeting everyone else in the group for the first time, gathering information about what the days will entail, and settling in. Day 1 feels like it goes on for a full week, and I feel quite disheartened when come mid-afternoon I realise that it’s still day 1 and I have another 6 food free days to go. Yup, I have experienced my first low. 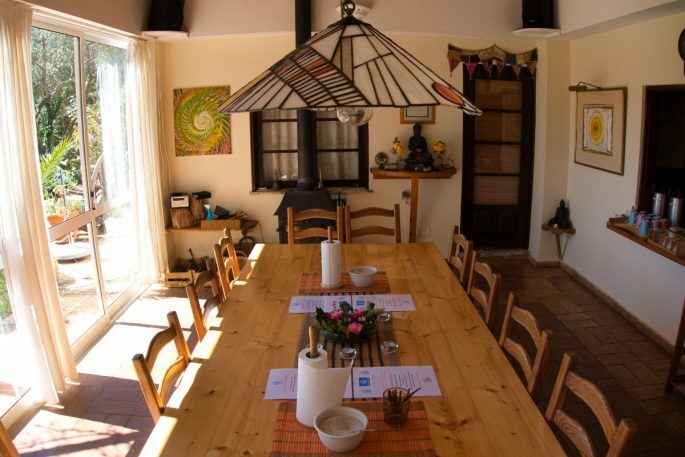 There are names to learn (my eight fellow guests and the staff) and the daily timetable of juices and pills to get to grips with. There will be juice three times a day and a clear veggie broth for supper. 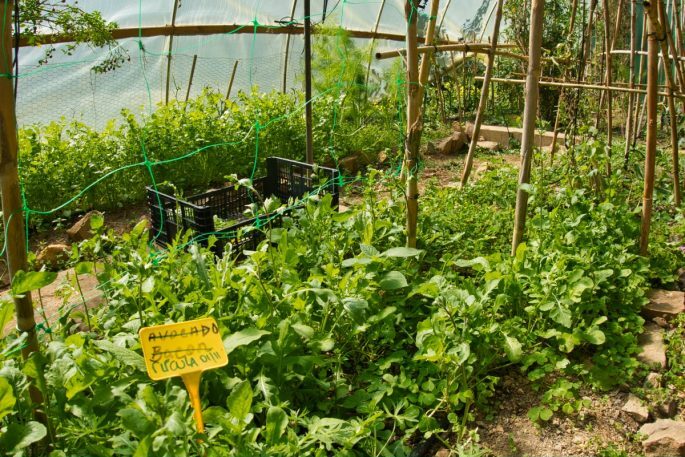 Medical contraptions are demonstrated to us, and we are shown different buildings and areas dotted about the grounds: the temple, the greenhouse, the sauna, the clinic. 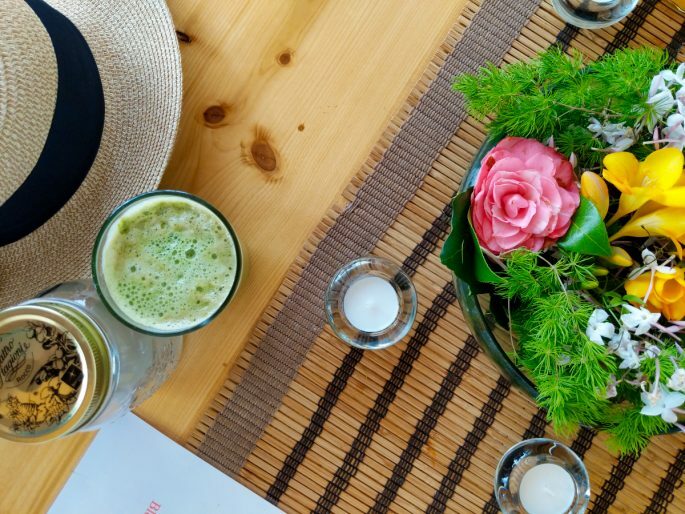 All our juices are taken in a ceremonial fashion around a dining table and preceded with a prayer to be thankful for the juice or broth we are receiving. The first time we do this, the atmosphere is a bit stiff and formal, we probably all feel a bit silly, and everyone is unsure what to expect. But we go round the table and one by one introduce ourselves. Immediately I realise the other people in the group are going to be the most fascinating aspect of the process and that feeling does nothing but grow as the days go by. 99% of the highs I see during the week are because of the group dynamic and the benefits of sharing this experience with others. I bring two books with me and a tablet stuffed with downloaded Netflix movies. I don’t need any of it. Arrival day at Moinhos Velhos is a Saturday, so the first proper day of the retreat is a Sunday. This means that all day on Monday you feel like it should be already be Tuesday and are a bit miffed that it isn’t. A couple of people had caffeine withdrawal symptoms on the first day, and took to their beds with fatigue, but for me today is the blip. Having not slept well I’m tired, grumpy and a bit low. I feel like I’m staring down the barrel of a hard week. I even skip the daily 8am yoga class which, given how much I love yoga, says a lot. But I wake up later feeling a bit better and join everyone for the first juice of the day, at 10 am. Looking back this is the only real low that I experience. Breakfast today is served with a special side order, as Moinhos Velhos founder Frank, a spritely and spirited 90 year old, joins us and shares his stories. 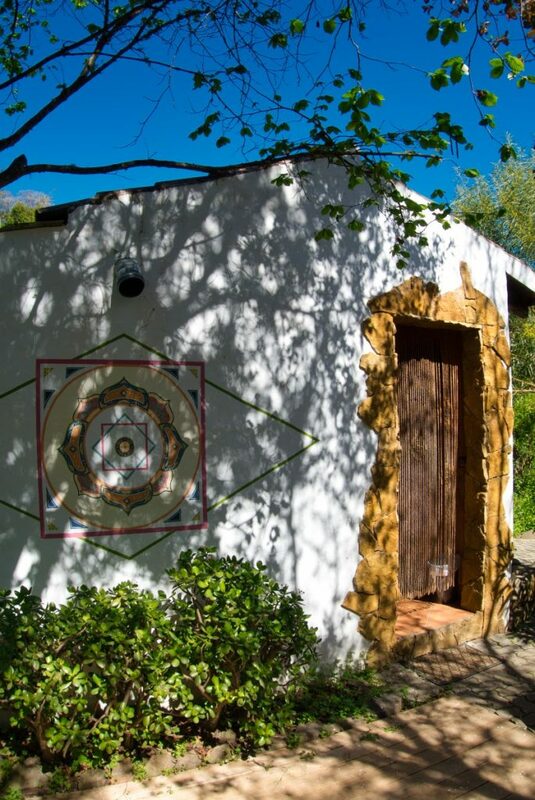 He started this place from scratch 25 years ago while looking for premises to build a yoga retreat. 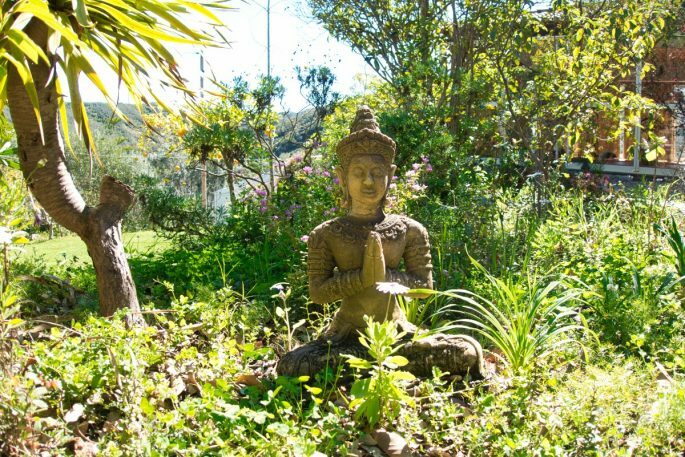 This certainly explains why yoga is so integral to the detox process at Moinhos Velhos. 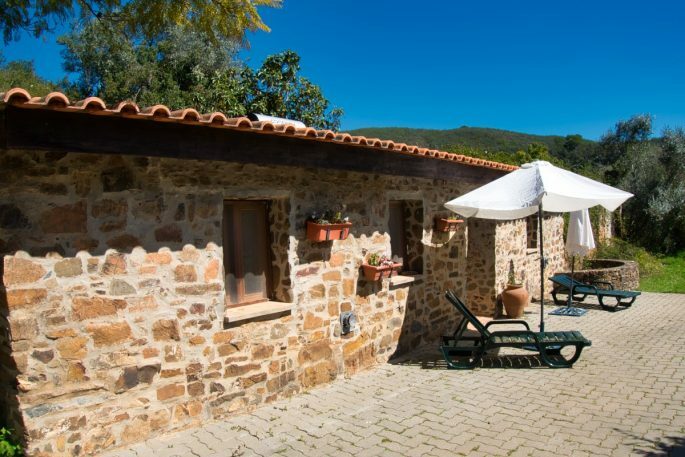 We don’t quite learn how he snagged this incredible location (Moinhos Velhos is tucked away in a stunning valley entirely surrounded by nature) but Frank’s enigmatic answer is that someone upstairs tipped him off about the plot of land. Yes, Frank is a real character. 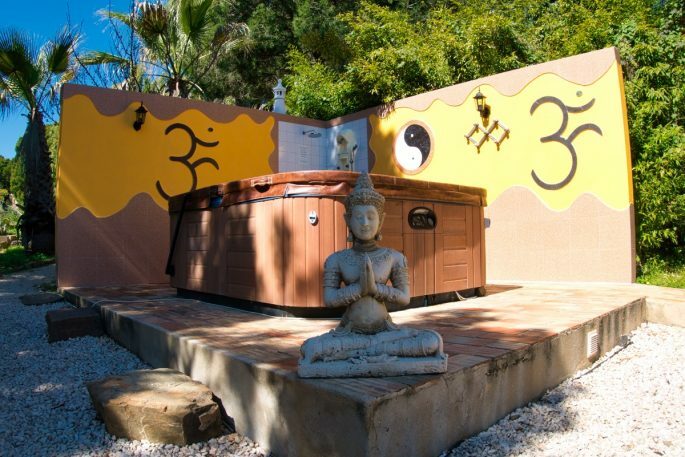 He’s clearly passionate about natural therapies, and cleaning the body on the inside as well as the outside. This includes colonics, which are self-administered in the privacy of your own bathroom with a device called a clysmatic. 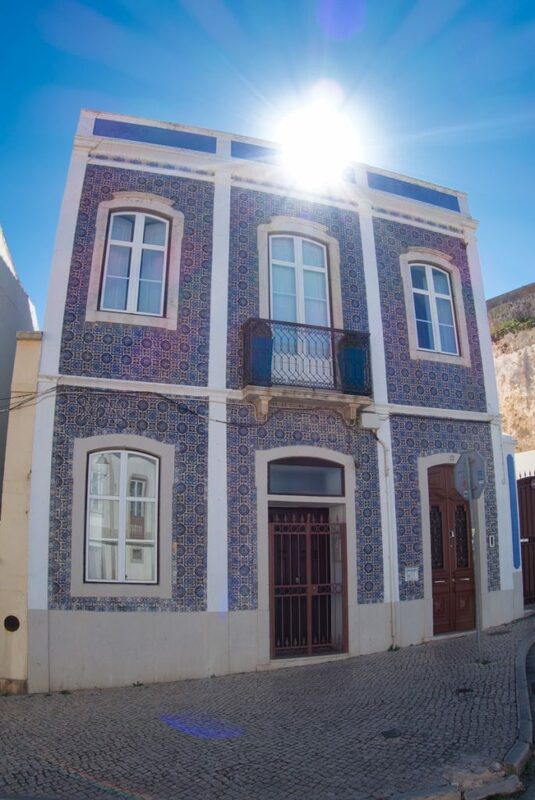 We’re all invited to sign up for any additional therapies at this stage which range from standard massages like deep tissue and hot stone to alternative therapies which make Reiki sound like a run of the mill visit to your GP. 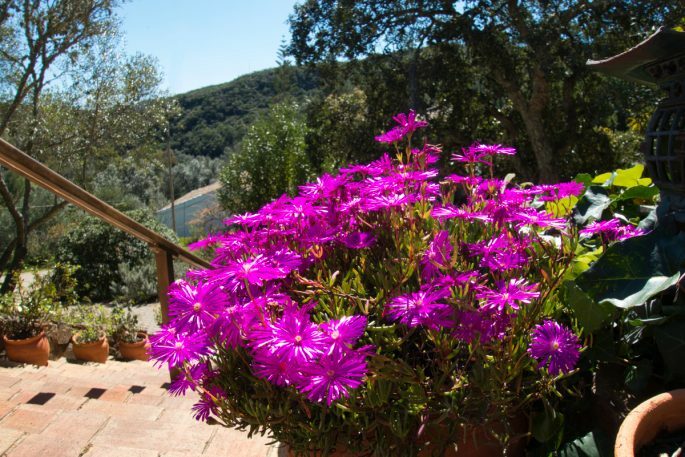 You’re not pressured to book anything and can ask questions about the practitioners, some of whom have been coming here for decades, so people sign up for whatever they fancy trying. 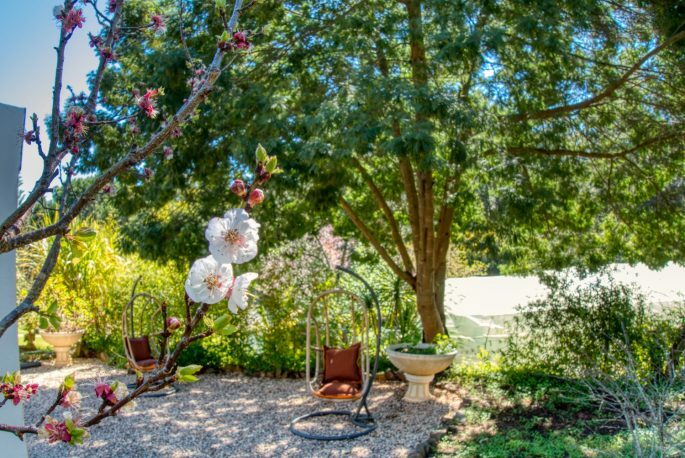 I realise that the retreat is already challenging me in unexpected ways; the physical aspect of swapping food for juice is somewhat easier than I thought, but it’s a mental struggle to figure out where I stand on some of the alternative therapies and philosophies on offer. Figuring out where I stand on all the therapies on offer isn’t always straightforward. I have first hand of experience of the success of natural medicine such as Ayurveda so I’m not a skeptic, but I’m not easily won over either. It turns out to be fun to debate this stuff with the rest of the group, and I take it as a welcome reminder to be more open-minded. Day 3 is a chilled day; we have settled in, and got our own routines, as well as the measure of each other. The atmosphere has changed now we’re all comfortable together, and we find ourselves discussing our private bathroom moments in more detail than we would dream of doing with our closest friends and family. 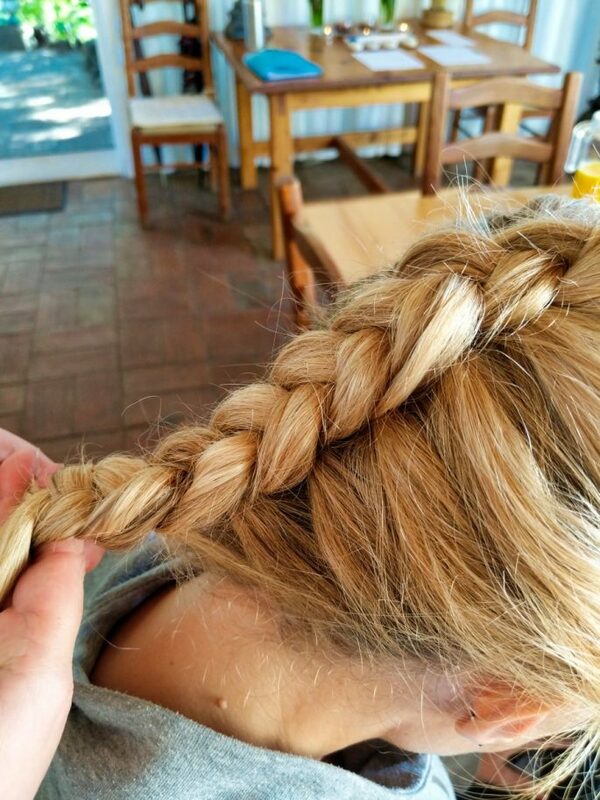 The group is mostly women, with the exception of one very brave/lucky/unlucky guy (depending on your point of view), and things like hair braiding start to happen. Something incredibly exciting happens on day 3; instead of the usual fruits, the 4pm juice turns out to be tomato, pepper and garlic, so it’s practically a gazpacho. 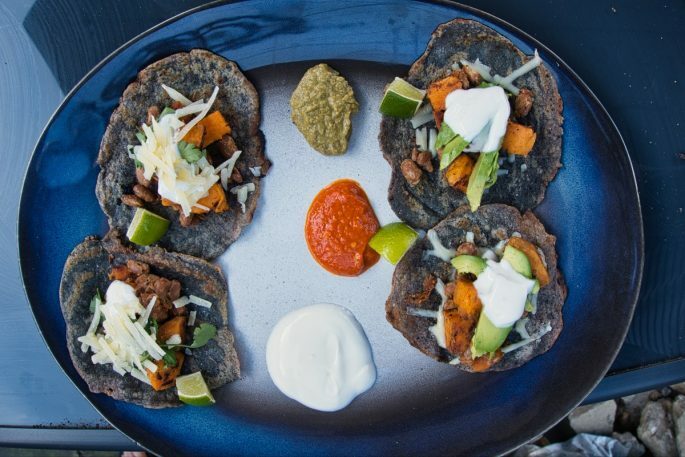 The excitement level created around the table by this savoury treat cannot be overstated. 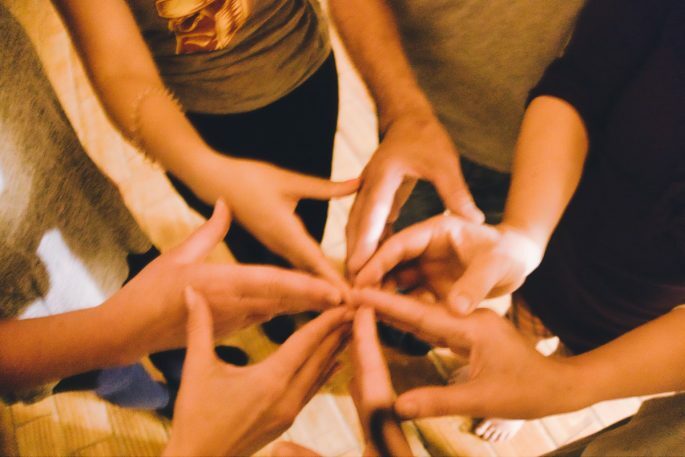 We are all acting like we’re high, we hurriedly throw our arms out across the table to join hands for the prayer, and sing with unprecedented levels of enthusiasm. 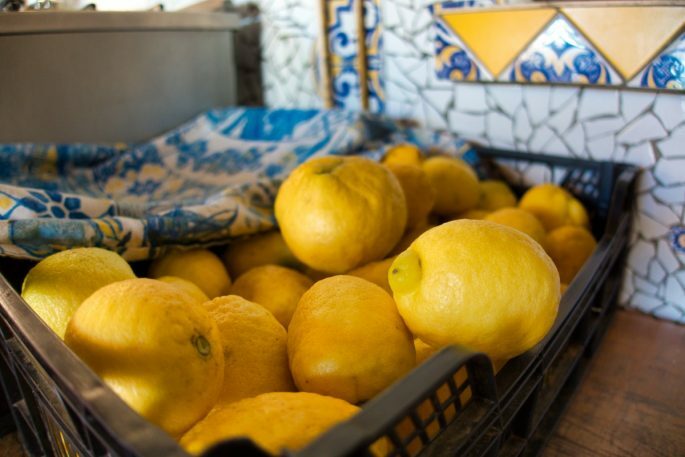 We also debate different techniques to squeeze the maximum flavour out of this precious nectar. 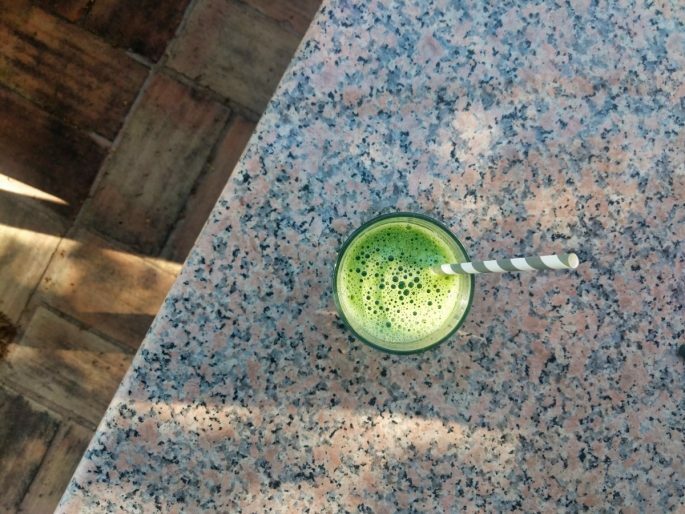 I opt for a straw (paper not plastic) and deliberately leave a little bit of my soup-juice in the glass so I can go outside and savour the last mouthfuls in silence in the sunshine. I have definitely learned how to appreciate the little things here. 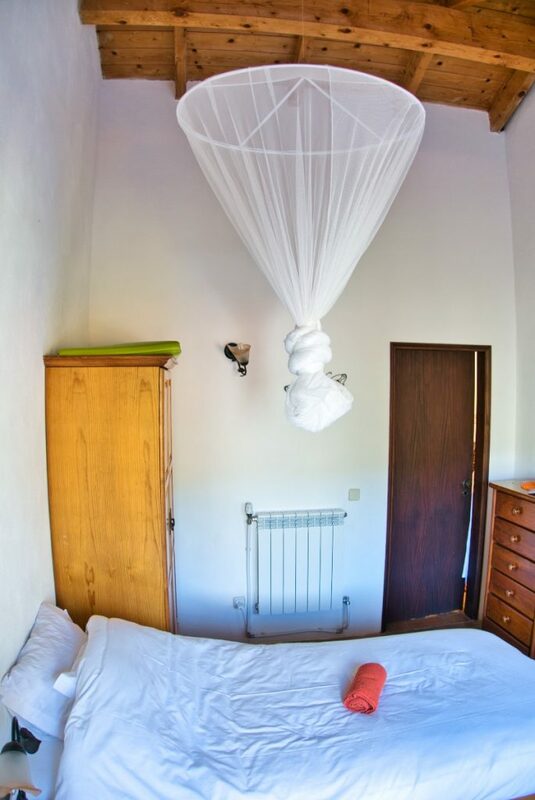 Our days go like this: wake up, drink lemon tea, do a yoga class, drink juice, sunbathe, take pills, use the clysmatic, more juice, walk, more pills, more juice, sauna, hot tub, more pills, soup, more pills and finally some kind of organised activity before bed. Tonight’s activity is a meditation session. 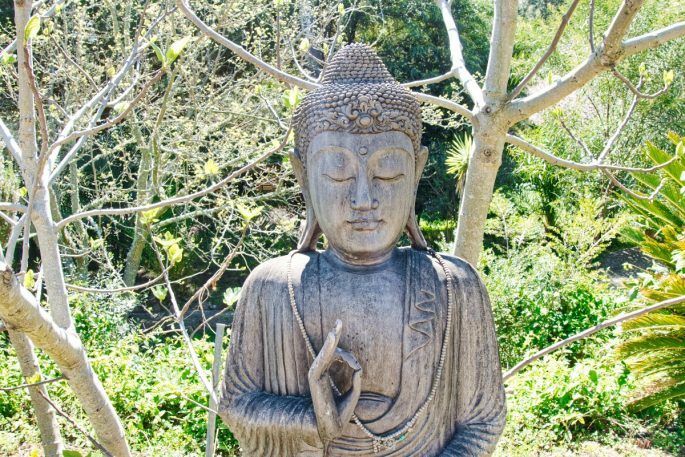 One of the group has done a 10 day silent meditation retreat with monks in Thailand so I feel churlish refusing to attend a single 25 minute session, but secretly the idea of sitting still and doing nothing frightens me. Even though the temple at Moinhos Velhos isn’t a beautiful Thai palace of carvings and ornate design, there is an undeniable atmosphere of calm that draws you in, and while my mind does wander during the session, I’m in a lovely peaceful state when it ends. It turns out we’ve done 45 minutes not 25 because we asked Chris, who is leading the session, to hide the clock as it ticks too loudly. Without a clock nobody even knew that 45 minutes had elapsed. 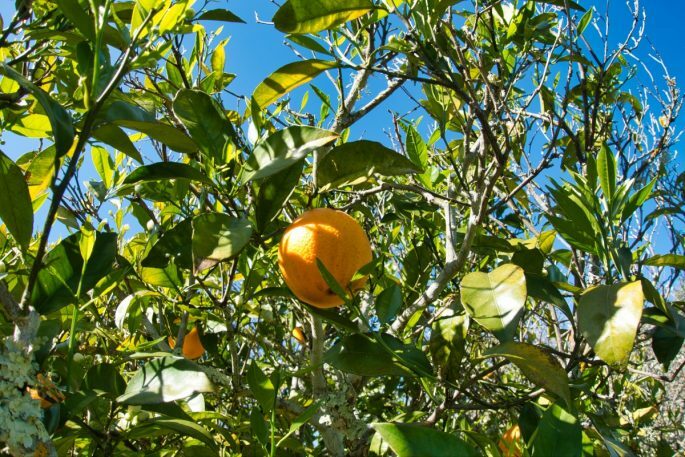 We have our own personal jug of freshly squeezed and locally grown orange juice for breakfast every morning. At home I’d be adding a bucketload of coffee and a bowl of porridge to this to make breakfast. But by Day 4 I can’t bear the sight of OJ anymore: my stomach feels completely and utterly empty and I can feel an acidity hitting my insides after drinking it that isn’t enjoyable. 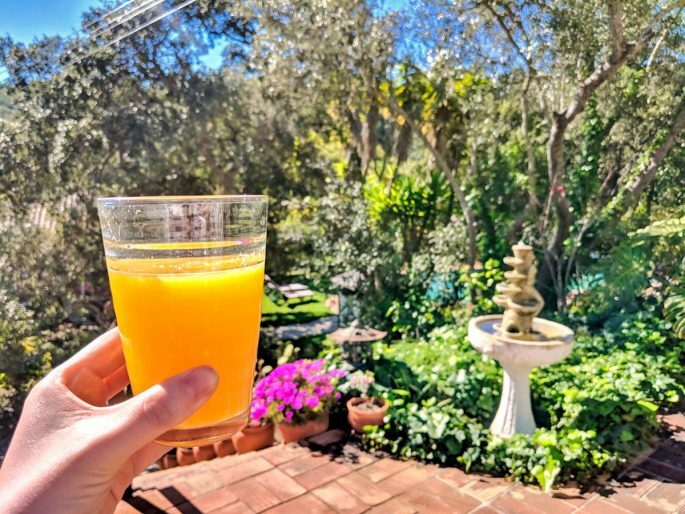 I’m told that the orange juice is helpful when the body is breaking down food, especially fats, but once they’re gone there’s nothing left inside your system to soak it up. When my OJ makes a reappearance pretty quickly after being ingested, I conclude that my body is ahead of schedule, and has already processed everything in it, and I need to change things up. I’m offered cooling cucumber juice from the next morning onwards in place of orange juice and I gladly accept. 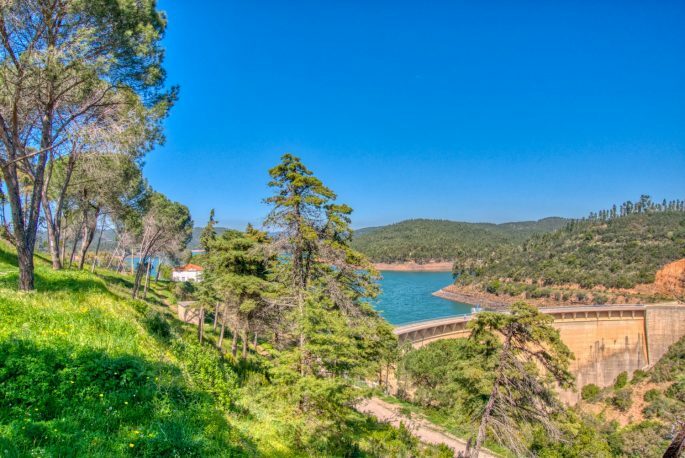 By now I’ve started doing a daily walk to the nearby lake – either with others or alone, depending on who is around. 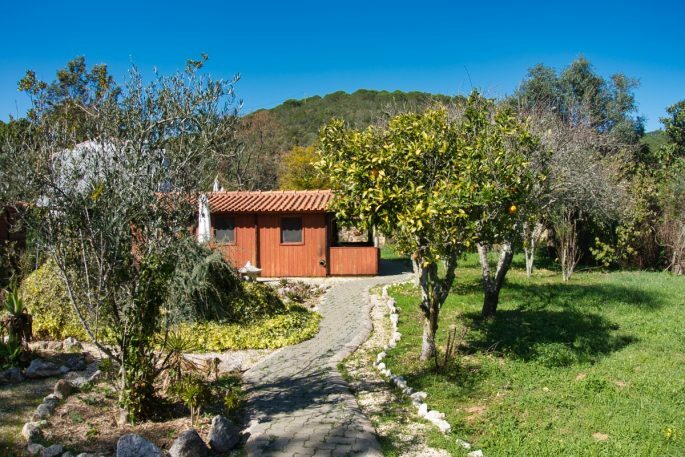 I realise that I need to get out, and I relish the additional excercise offered by the pretty steep hill that takes you out of Moinhos Velhos and up to the lake area. We emerge from the retreat on Thursday for the beach excursion like new babies coming out of the womb. For the first 10 minutes of the drive I feel like I’ve never seen the outside world before. A bird takes off in flight in front of the car and I find myself watching in awe, through my clear and incredibly awake eyes. 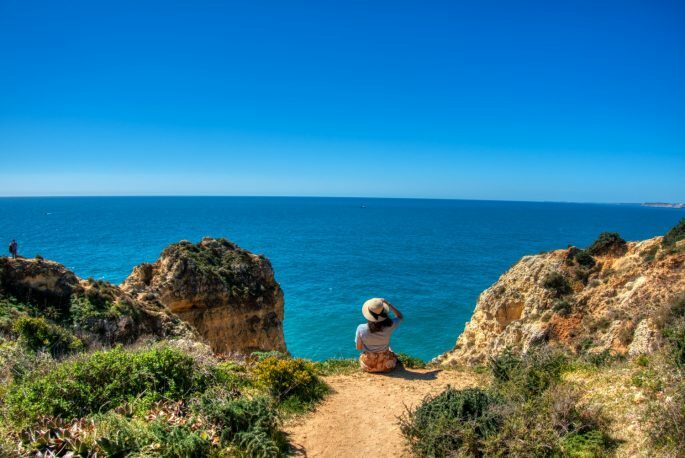 The highest point in the Algarve is nearby and even though the mountain has suffered from forest fires just like much of Portugal, all around us is verdant and lush and incredibly peaceful scenery. 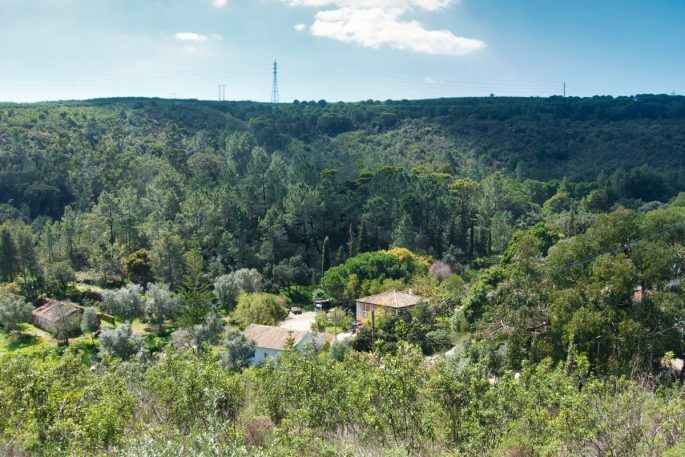 We barely meet another car on the road but the number of houses set into the surrounding greenery steadily increase until we reach the village of Bensafrim and then the busier Via do Infantile. Everyone shares a sense of excitement to be ‘let out’ and by now we’re trusted to be around other people, and food, without wavering. 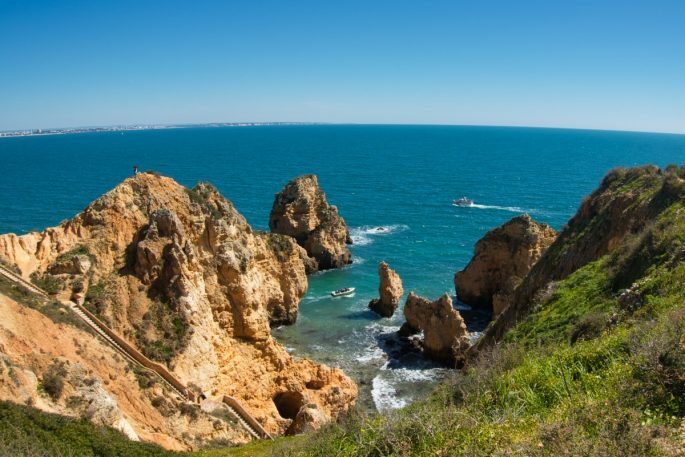 We’re headed to one of the area’s most famous viewpoints, Ponta da Piedade, before continuing to the expansive sands of Praia Porto Mos for an afternoon lazing around on the beach. The juice comes with us, and today it’s honeydew melon, which is succulent and sweet and insanely moreish. 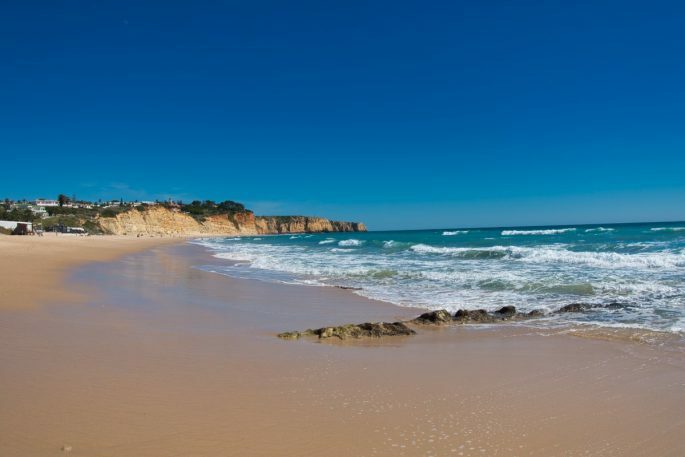 At the beach I smell perfume for first time in almost a week and I’m struck by how strong and heady the fragrance seems – later I smell cigarette smoke and it’s an even bigger shock, though as an ex-smoker I’d be lying if I said I wasn’t feeling a combination of disgust tinged with jealousy. 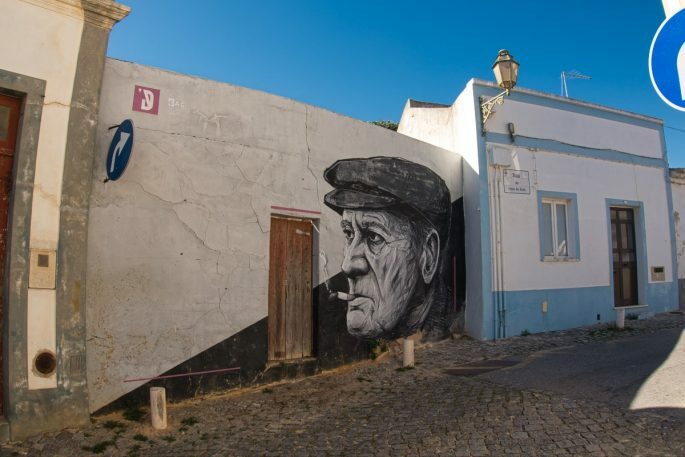 street art in Lagos – plenty of time to explore when you aren’t stopping for lunch! 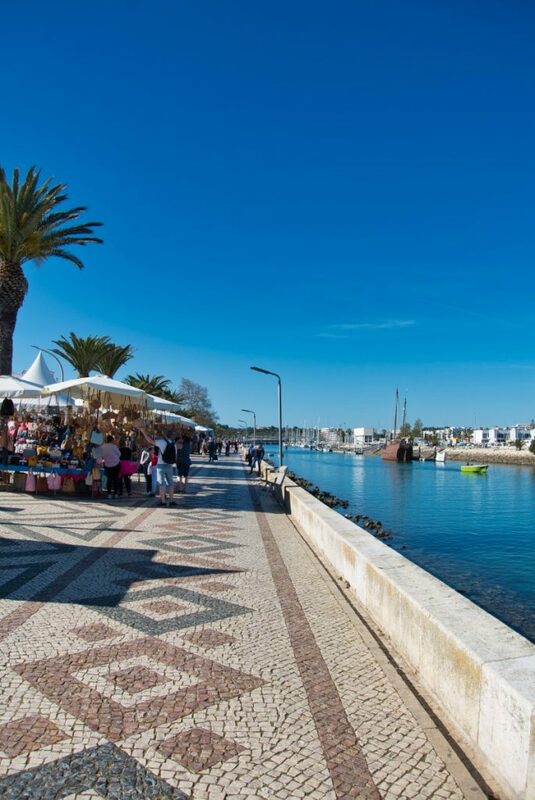 We then head into the town of Lagos for some sightseeing and souvenir shopping. On any other holiday I’d be spending all my time in these cafes, restaurants and shops, relentlessly consuming, so it feels strange to be aloof from the process of picking a place to eat, but it feels rather nice. 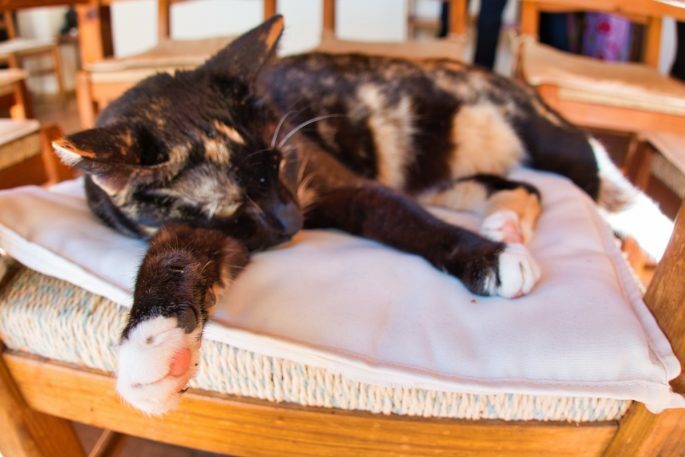 This is a busy day for the Moinhos Velhos gang: at broth time we’re distracted from the relentless monotony of the clear vegetable soup by newcomer Trixie, who has been a therapist at Moinhos Velhos for over a decade and hails from Vienna. She is leading us all tonight in something called Biondanza, a dance-based set of trust and self-expression exercises which any English person should, by birthright, be appalled at the sound of. Like so much on the retreat it actually turns out to be a huge amount of fun. The dancing is built up gently, starting in a circle like you’re in a playground, and culminates in prancing freely around the room with your eyes closed, while another person makes sure you don’t bump into anything. The energies people have lead you to dance with each of them differently, and you can intuitively feel who you’re more comfortable with. I particularly bonded with another girl and so it was brilliant doing the excercise with her – though we both agreed that we’d love to try it with our partners sometime. Every day you mix your juices with 2 other things: psyllium husk which makes you feel full and is a natural health food and laxative; it kind of scrubs you out from the inside like a loofah. And bentonite clay, a sort of super healthy mud that attaches to toxins and other gross stuff in your digestive system and draws them out. 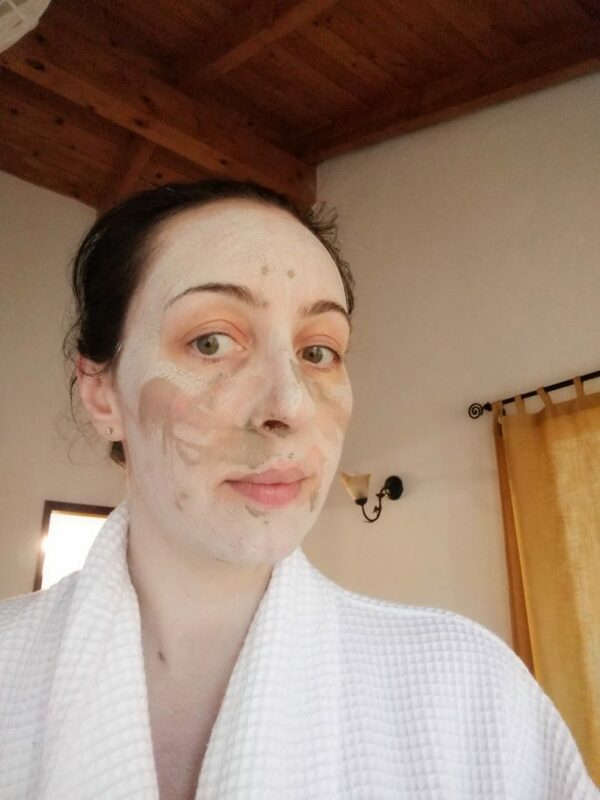 By now I have of course looked up bentonite clay on Amazon (there’s wifi here, just not in the dining room) and discovered that its famous detoxifying properties make it an amazing face mask too. So we’ve all started trooping down to the wood-fired sauna when it’s turned on at 5pm to smother the clay we’ve been eating all over our faces. We then sit in the hot tub covered in said clay. It’s yet another welcome distraction from the lack of food, and makes the whole thing a bit more like a spa break. We must look silly, but at this point not one of us cares a jot. Three of us have moved onto lettuce leaves for lunch, taking juices and broth as usual, and I’m actually glad to be starting the slow and gentle process of reintroducing some food into my body while under supervision, as I can see that working up to a meal is going to take time. We’ve also been told that the foods you eat directly after fasting are incredibly important because the body will feast on the nutrients they offer, so this is not the time to have that pizza you’ve been craving. 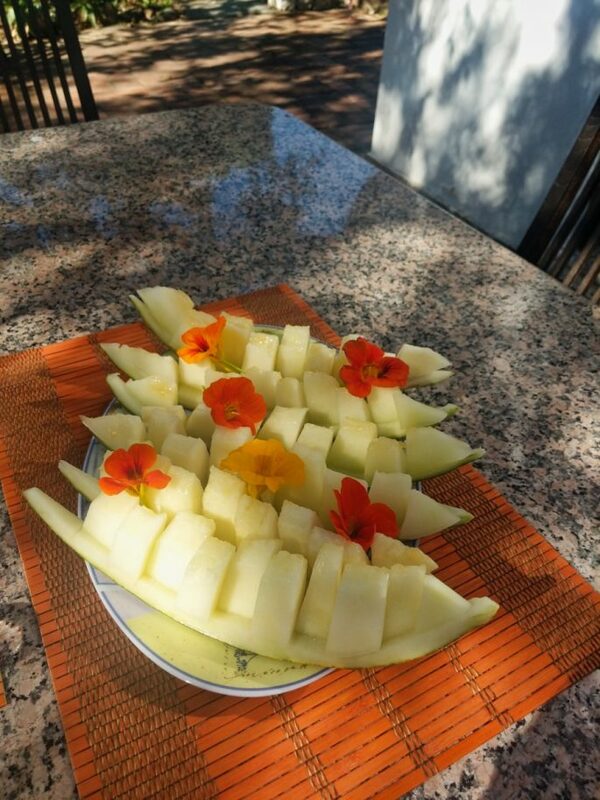 Melon is suggested for breakfast and salad for lunch. 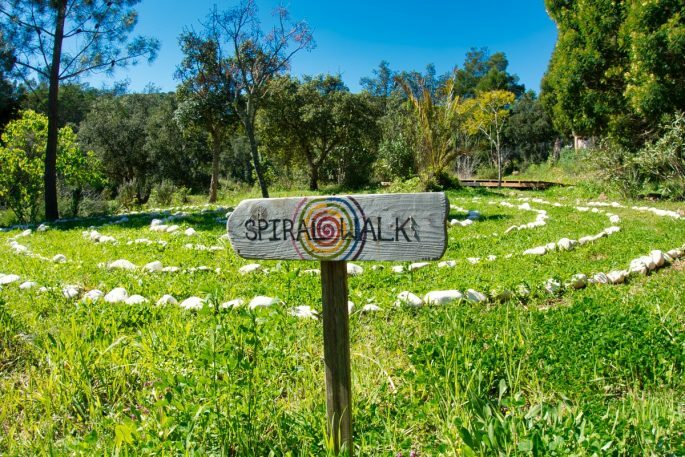 Our evening activity is a spiral walk: an introspective excercise which invites you to concentrate on all the things you no longer want in your life and cast them out, replacing them with whatever you want more of. We use candles to signify the extinguishing of the negative and the igniting of the positive. Like everything else I feel somewhat matter of fact about it all until I do it, and then I nearly cry. 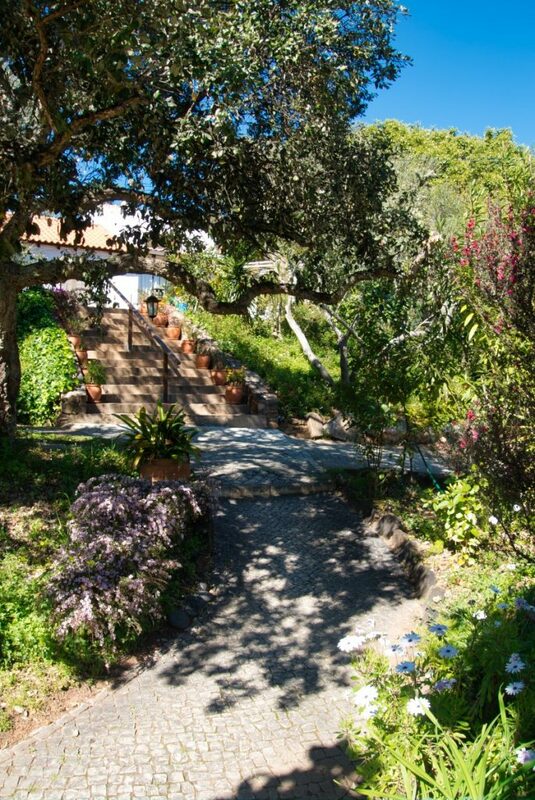 I’ve been on other retreats where I have cried so I think I’m just on top of the crying at this point, but others shed some tears and we are all respectful of each others’ private emotions. It’s all very cathartic. It’s Saturday again. 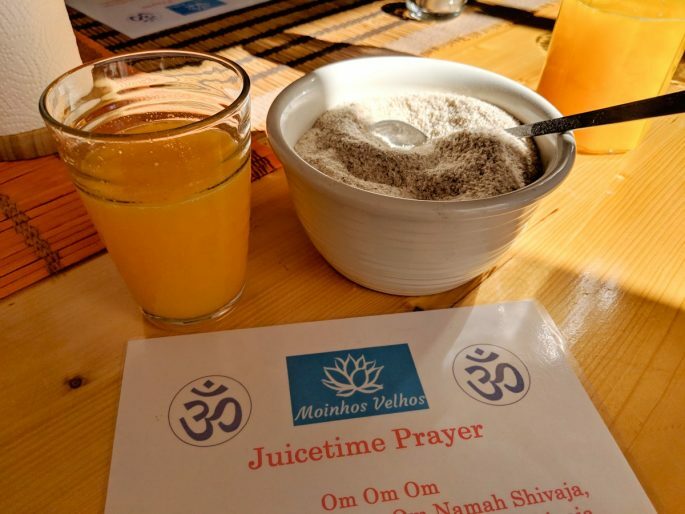 This time last Saturday I had no experience of juice retreats overseas, or of fasting, and I wasn’t sure what to expect from my week at Moinhos Velhos. 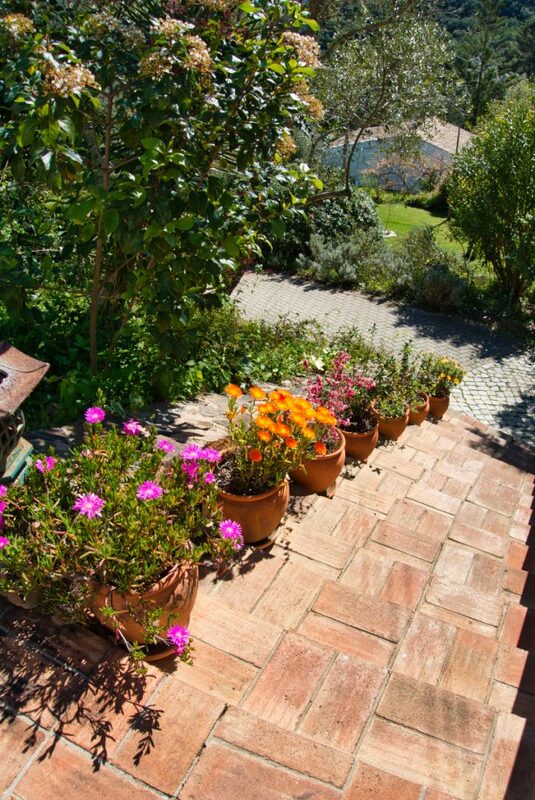 What I did know was that dragging myself up the pretty big hill that separates the accommodation from the dining room was an effort. A week on, I’ve learned a lot. And I have watched as my body has shrunk and tightened, and the hill has become a pleasant challenge not a sweat to tackle. 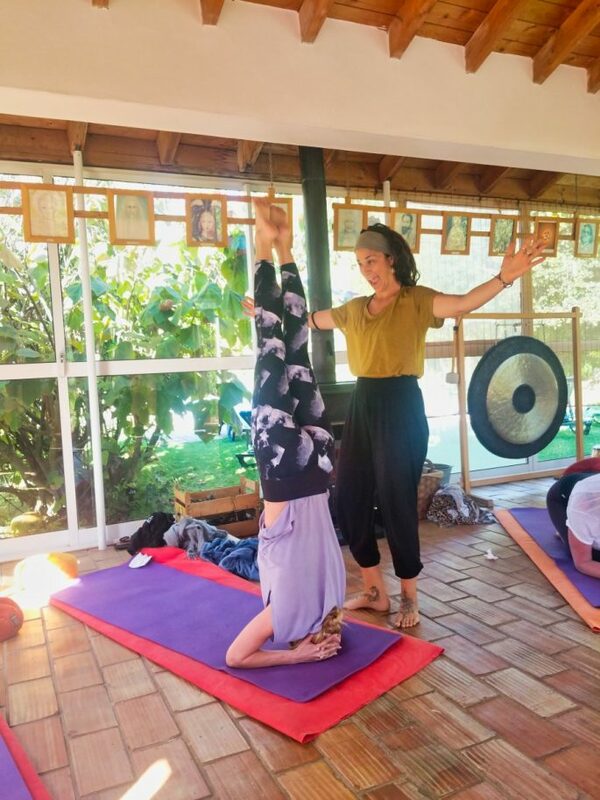 Some of what I’ve learned has been about myself, some of what I’ve learned has been about Moinhos Velhos, but I can honestly say that the lion’s share of knowledge has been imparted by being around other people on the retreat. 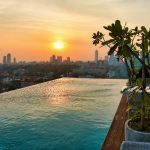 Having the opportunity to hear others’ unique take on the world, and to benefit from their different subsets of knowledge has brought a freshness and a joy to the week that I could never have imagined. Also I’ve learned that the Bulgarian world for a cat’s purr is ‘murr’. 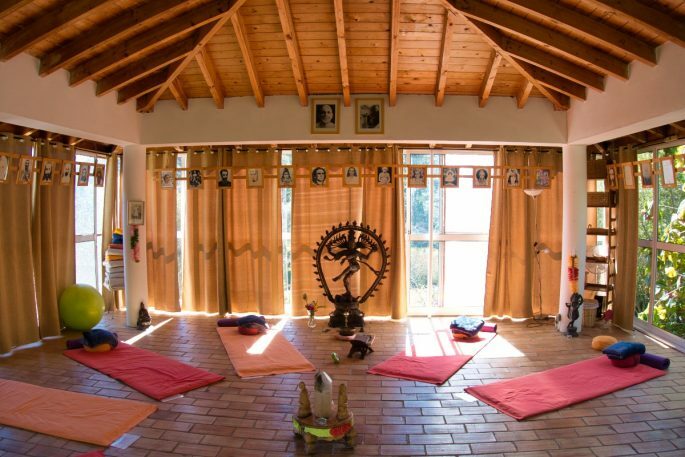 I’ve been doing yoga for years and have tried a number of different types of retreat that involve yoga, from an artist retreat in Kent to a yoga retreat in Mexico, and I’m always surprised by how much the yoga on offer can differ. 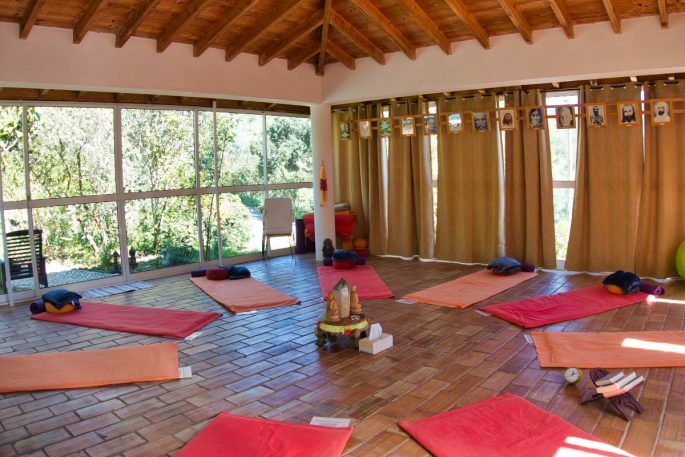 At Moinhos Velhos the emphasis in the yoga classes is very much on the spiritual side, with plenty of prana (breathing). Even though I enjoy the sense of balance that yoga brings (it’s a great way to start the day) I’m someone who loves yoga classes at the gym; I do it for the workout just as much as the wellness, so I find I’m worried about being challenged physically. 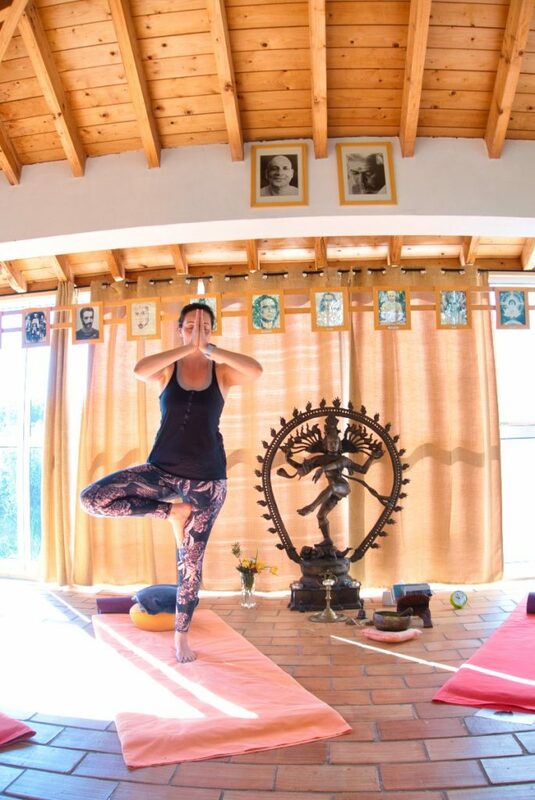 There are three different yoga teachers and each has a slightly different pace and style (we all have our favourites), and as the week goes on the classes become more intense. I can see that a balance has to be struck between pushing us, while still allowing for the different ability levels, and taking into consideration the fact that we aren’t eating anything. As I wait for my taxi I ask everyone in the group about their own personal highlights, and I find they’re all different. For most the yoga has been a real high point, especially those who achieved headstands perhaps for the first time. 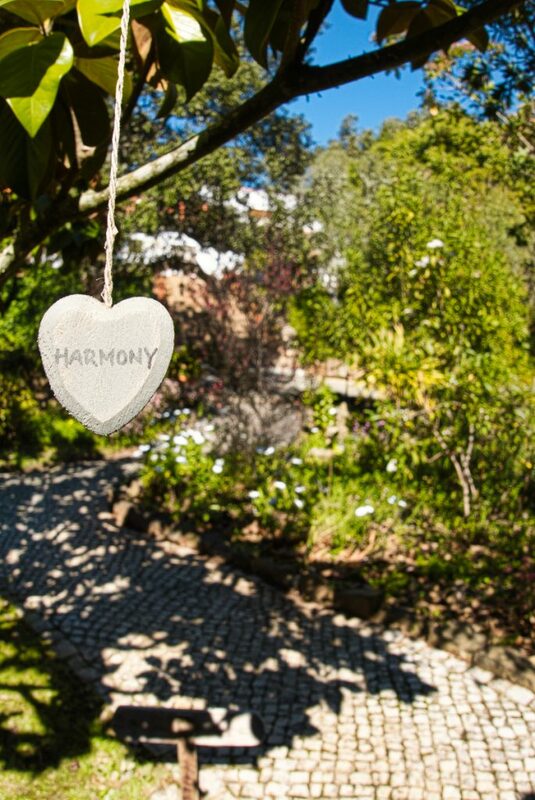 Others love the silence, the gardens and the mediation. 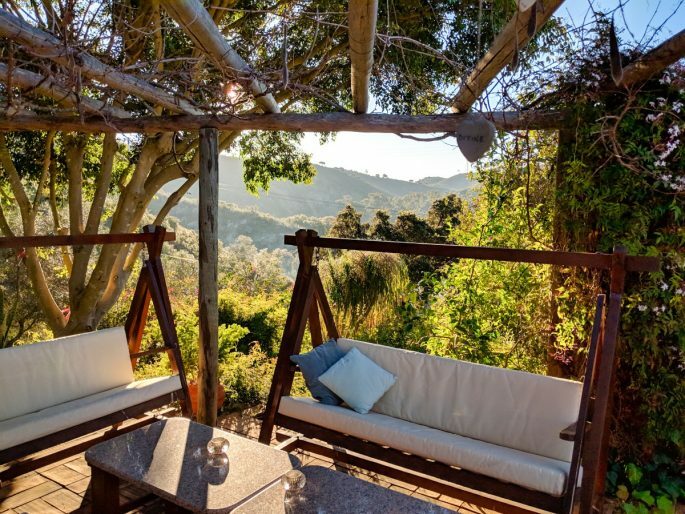 Some simply welcome the opportunity to be introspective and reconnect with themselves with no pressures or distractions from the outside world. Everyone’s reasons for coming are different. Tackling menopause symptoms, tapping into a sense of self, re-evaluating life goals, taking time away from family pressures, or just hoping to look and feeling younger and more energetic. 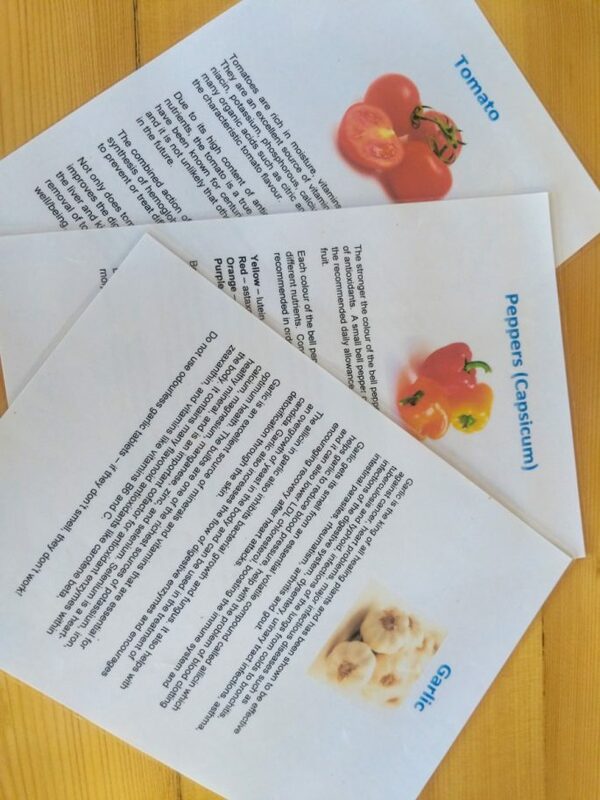 We’re given a lot of detailed information about how to gradually re-introduce food back into our bodies after the juice retreat ended, and there is plenty of information available online about which foods work best. Your stomach will have shrunk a lot, so it’s wise to eat tiny portions regularly, rather than having a big meal. 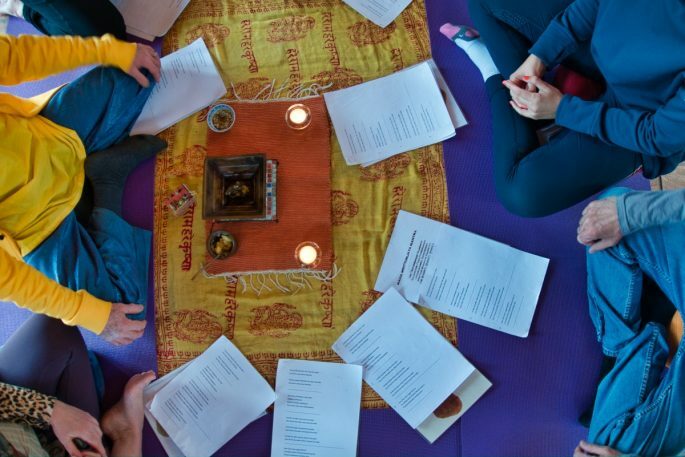 Knowing your own body and digestive system (which if you didn’t before the retreat you will by the end!) is probaly more important than anything else, and so you need to listen to your gut, literally. If you know your body usually struggles with a certain foods (I have a hard time with chillies, seafood and dairy) then wait as long as possible before throwing that into the mix. 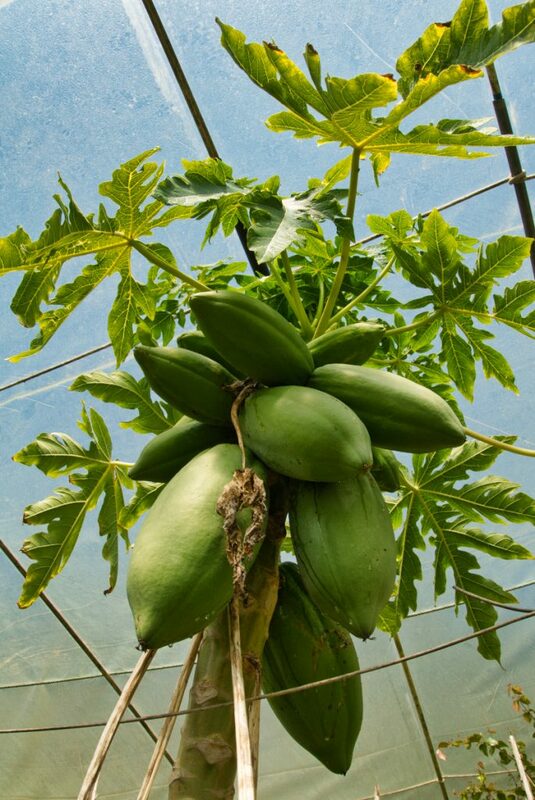 We are advised to start with raw fruits and vegetables for 2-3 days. 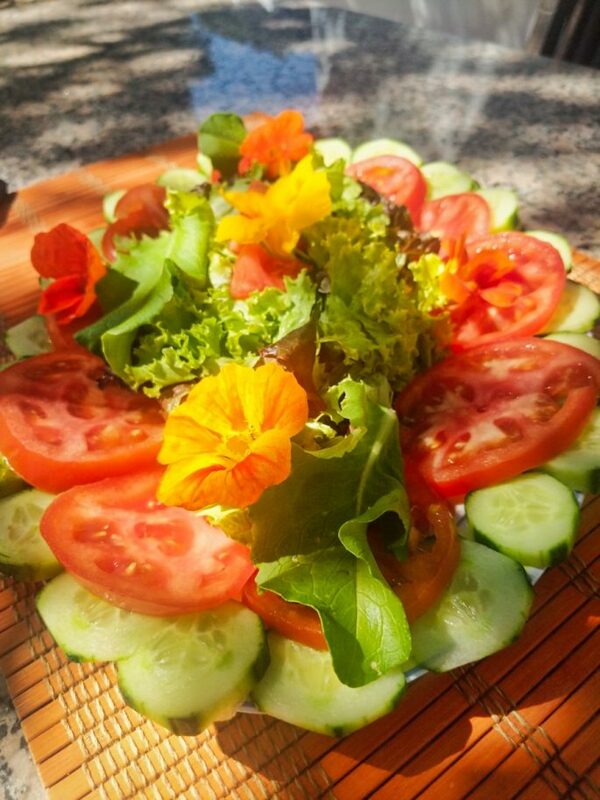 First lettuce, tomato, cucumber and soft fruit like melon. 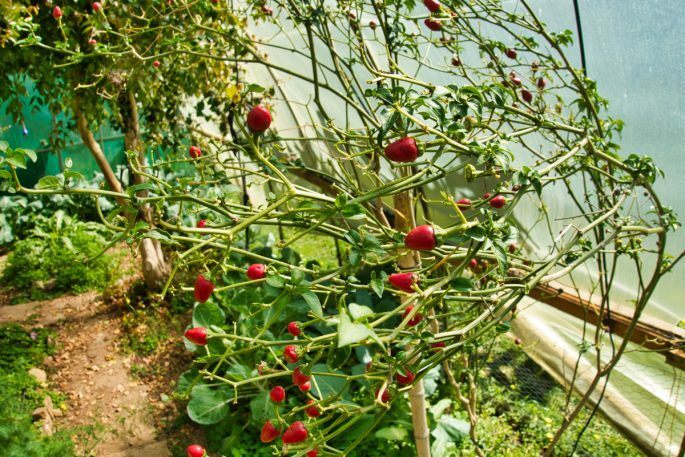 At arriving home I keep drinking fruit juice as well as eating raw food, and I stock up on light soups, nuts, avocado, quinoa, leafy greens like kale and spinach, and eggs. I wait a couple of days to start on eggs with the whites only. I’m delighted to find dark chocolate on a list of approved foods, so I get a small bar and nibble on it as a treat. I take almost a week to add a little bit of bread into my diet, and I very carefully had a coffee after a few days of eating normally. 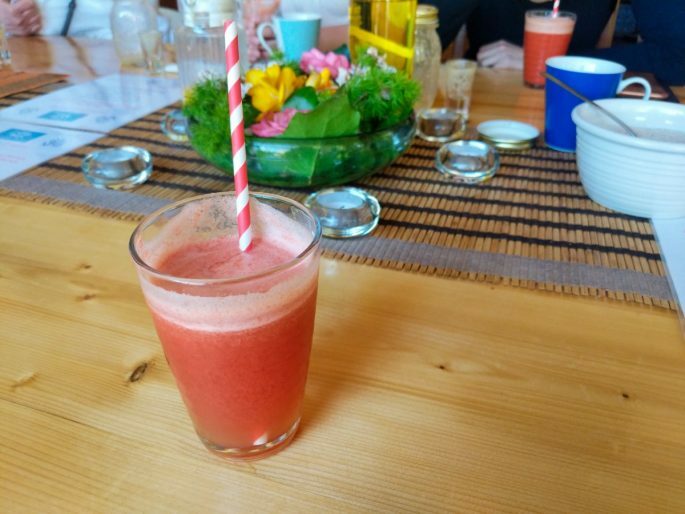 One of the benefits of a juice retreat is that you will savour the flavours of everything you eat and drink afterwards, which all seem to have been dialled up to 11 – and any added salt really zings on your taste buds. I made a mental note of how I felt on the way to Moinhos Velhos. Tired and with a headache that seemed to be with me throughout the day. 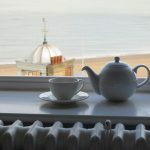 I was also heavier than I had ever been and even though I’d been on an incredible Ayurveda retreat in Sri Lanka 5 months earlier I’d fallen back into bad habits at home, like drinking a whole cafetiere of coffee to myself, and watching TV cradling a giant packet of Minstrels. 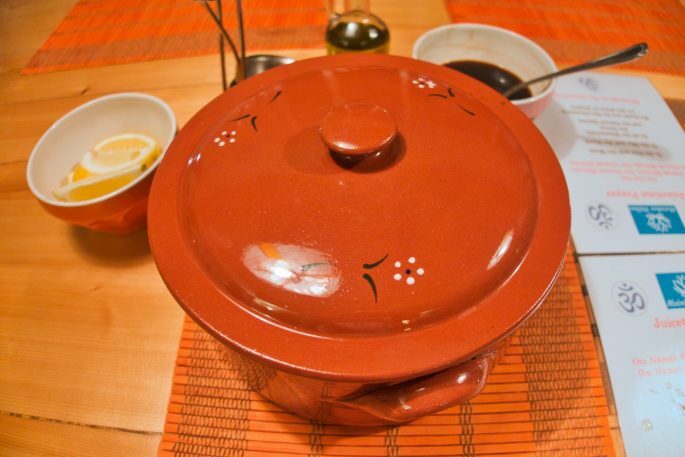 I was finding it impossible to lose weight at home, surrounded by temptation. When I get on the bathroom scales after the juice detox it’s with a real sense of anticipation; I am delighted to see I’ve lost around 7 lbs in a week. If I’d tried to do this at home it simply would not have happened. Next time I want to drop a few pounds and reinvigorate myself, I’d do a juice weight loss retreat in a heartbeat and nail my goal in a week rather than struggle on yo-yoing back and forth for months on end. 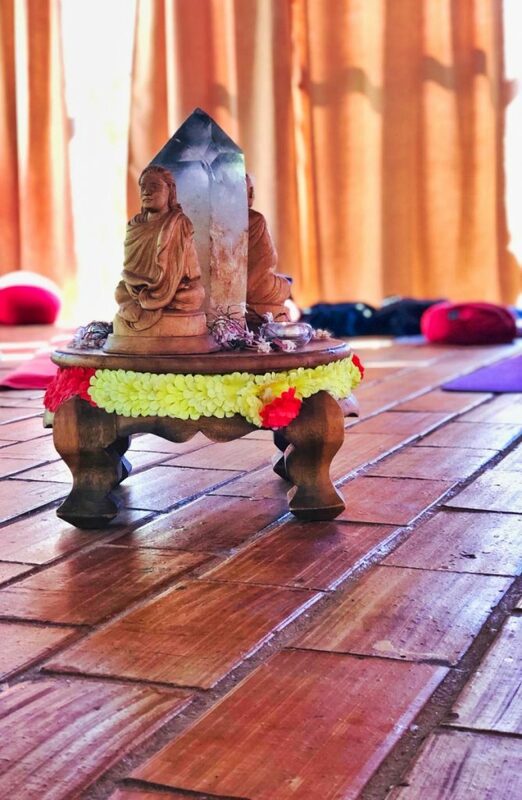 I took a lot of the spiritual side of the Moinhos Velhos Retreat with a pinch of salt – I still respected and enjoyed all of the prayers and exercises but I tried to retain a sense of humour and a healthy skepticism about it at the same time. Having said that I can’t deny that I have come home feeling different. Yes I’m 7 lbs lighter, and my jeans fit me again; in fact all my clothes feel loose for the first time in ages, which is blissful. But mentally I also feel pounds lighter, and am determined to maintain this feeling of weightlessness in both senses. 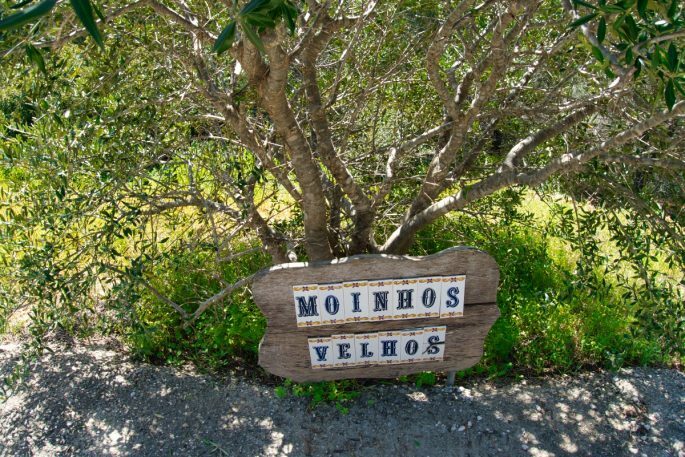 There are no facilities to do laundry at Moinhos Velhos other than by hand, so you’re advised to bring as much clothing as you’ll need for the duration of your stay. 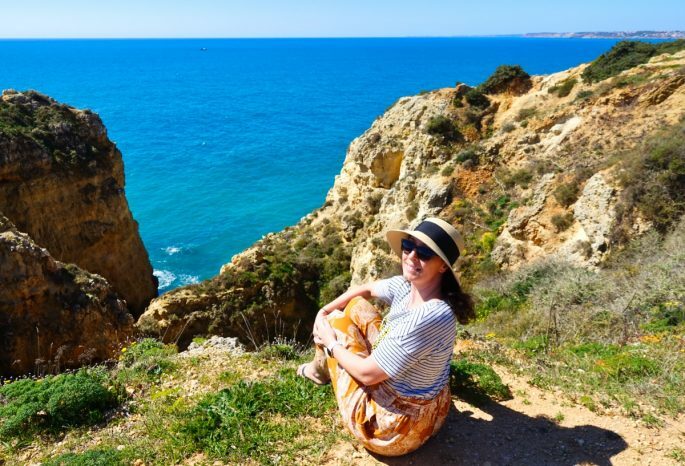 Exactly what clothing you bring will depend on the weather forecast and the time of year you choose; on my visit in March it turns out to be unseasonably warm and sunny, so I pack a relaxed summer wardrobe. I pick casual, loose clothing, so that I will be comfortable during the detox process. Much of it comes straight from my gym bag with key pieces from my ‘sitting around the house’ collection. There’s no getting dressed up for dinner so I’m happy to leave the dresses and heels at home for this one. 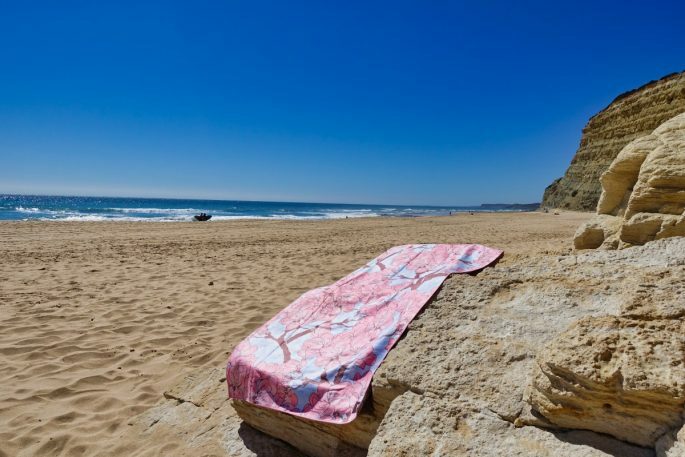 A robe and towels are provided for your room, but I bring my own special beach towel which packs up super small and is far easier to carry than a normal towel. It’s designed to be used at the beach without picking up any sand, and to dry in record time. I inadvertently test this feature out when a gust of wind blows the whole towel into the pool one day but it goes from sopping wet to dry in about an hour. 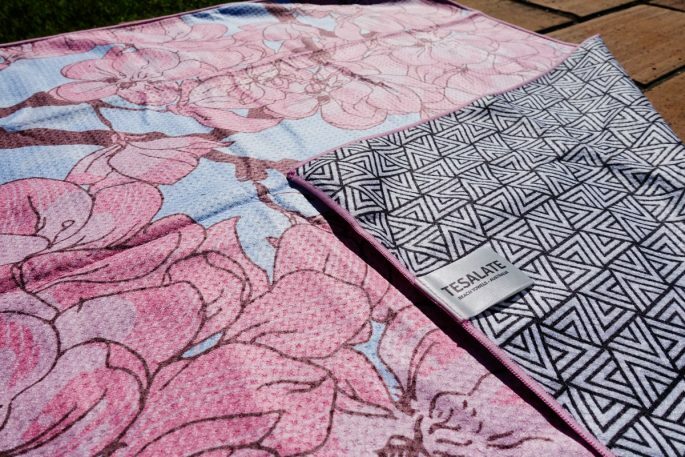 I have a lovely pink sakura blossom design which is great for yoga but there’s lots of other versions and I’m coveting the leaf pattern as well a some of the bohemian styles. 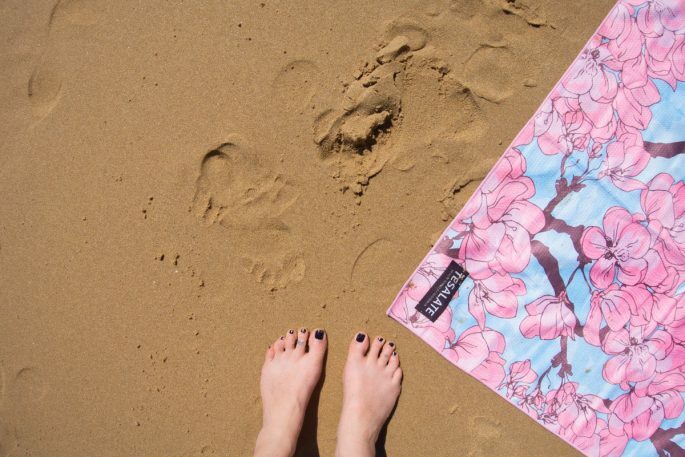 I snagged you a discount code too, so you can pop promo code SAVOIR15 into the Tesleate website anytime you want and get 15% off your own sand-resistant beach towel. 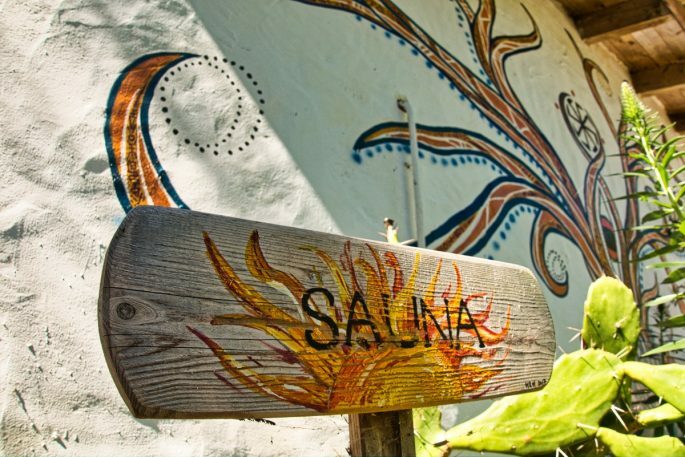 You’ll sweat out toxins in the sauna, so why replace them with more chemicals? It’s ideal to avoid chemicals during any juice cleanse so you can fully benefit from the detox, and that includes what you put on your skin. The skin is the largest organ the body has, and anything you apply to the skin might as well be injected, because it’s soaked directly into your bloodstream. All the chemical-packed creams and deodorants we apply on the outside of our bodies end up inside us which is a bit horrifying when you really think about it. Using all-natural cosmetics will help give your body a complete rest from processing these chemicals and an extra helping hand in fully eliminating the toxins. PitRok natural crystal deodorant – This all natural deodorant leaves an invisible layer of mineral salts on your armpits that stops sweat but doesn’t block pores and it doesn’t contain aluminium and parabens either. I usually use this deodorant after the gym anyway, to let my skin breathe, but for this trip I didn’t bring any other deodorants or body sprays at all. Jason Natural Body Wash – I’ve been using Jason body wash for years as I have super sensitive skin, so there was no need for me to switch to a natural product just for this trip. I love the mango ‘flavour’ the most, but I like to mix it up with different scents sometimes, Aloe Vera and Apricot are lovely too. 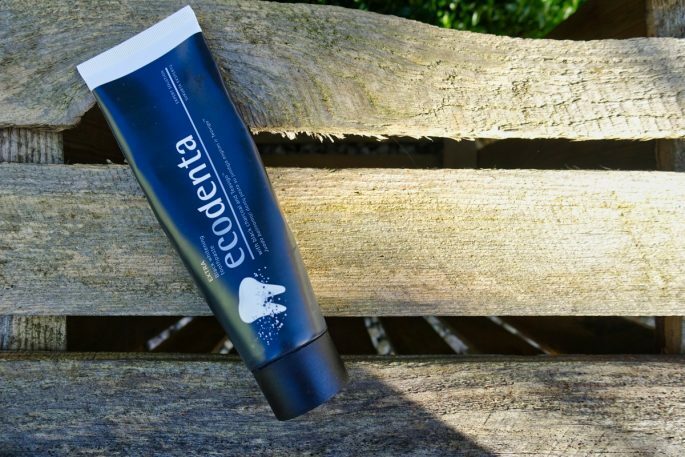 Ecodenta Charcoal toothpaste – I already use this natural toothpaste when possible but for the juice retreat I used is exclusively. I have tried other natural toothpastes and I think they taste horrible, but this has a really nice flavour and actually whitens your teeth. I read the reviews of Ecodenta Toothpaste on Amazon before buying and I’m glad I discovered it. Waterpik water flosser – We eliminate a lot of toxins through our tongues (that’s why after a heavy night you wake up with a furry tongue. Gross!) so I brought my cordless waterpik which I switched to for flossing a few months ago, and which I wouldn’t be without. During the juice detox we are given a talk about the importance of scraping your tongue, ideally every day but especially during any kind of cleanse, and I am glad my Waterpik comes with a scraping attachment as it seems much more thorough and hygienic than a regular tongue scraper. Sinus Wash – In England not many people seem to know about or use sinus wash, but I was lucky to be introduced to it by an American girl when I was travelling and got the flu: after a day using it, the illness disappeared. It has been a lifesaver on so many occasions. Rinsing out the germs and bacteria that get caught in our sinuses is another key part of the detox process and I personally find these squeezy bottles so much easier than the gravity fed Neti Pot version. I’m so happy I discovered Tropic facial oils, they’re my favourite natural skincare products. Body brushing is a must too! 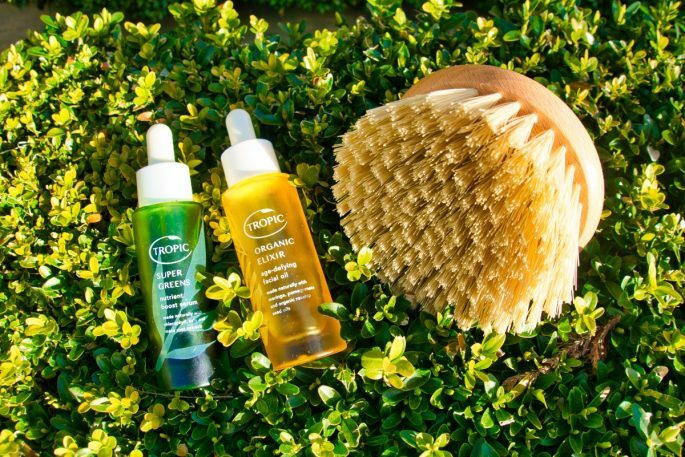 Tropic Skincare – I switched to using Tropic natural skincare products on my face last year, after getting a sample of their SuperGreens facial oil amongst a load of other miniature products. Even though everything else was more expensive and by bigger brand names and I had never even heard of tropic, I wasn’t that impressed with the other samples but SuperGreens serum is still the best thing I’ve put on my face in years. I get really bad flaky skin and this is the only thing that sorts it out, making it feel plumped up and healthy. I know I’m not imagining this because on the juice detox I used SuperGreens before dinner every night and was asked if I’d put make-up on because my skin was ‘glowing’. I love that all the products are natural, with no preservatives or chemicals and are shipped to you within 2 weeks of being made so they’re fresh. 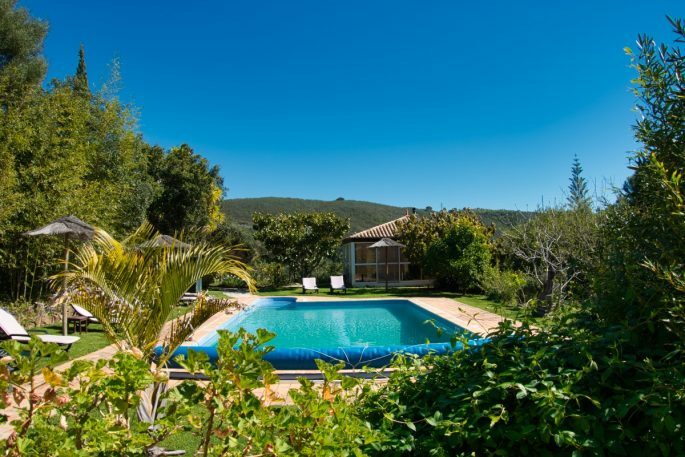 You will probably spend very little time at Moinhos Velhos in your room because of the busy timetable and the beautiful gardens and pool area. 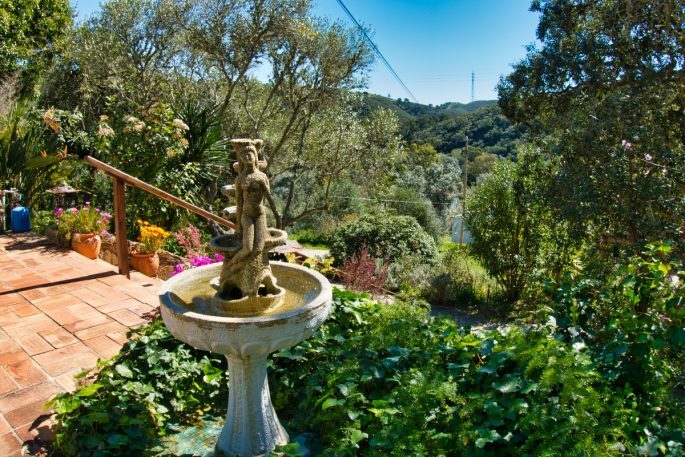 It’s a bit like the detox itself: better out than in. 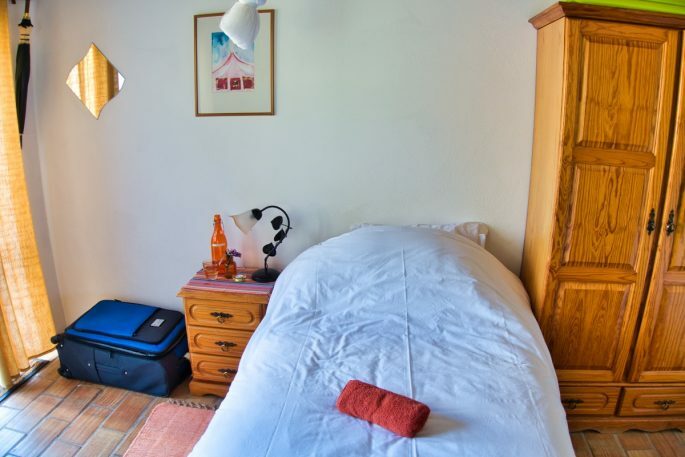 The rooms are therefore pretty basic, but they are clean and comfortable for what you need. They’re cleaned every day too. There’s wifi but no TV or radio. I can honestly say that I spent more time in the bathroom than I did the bedroom. 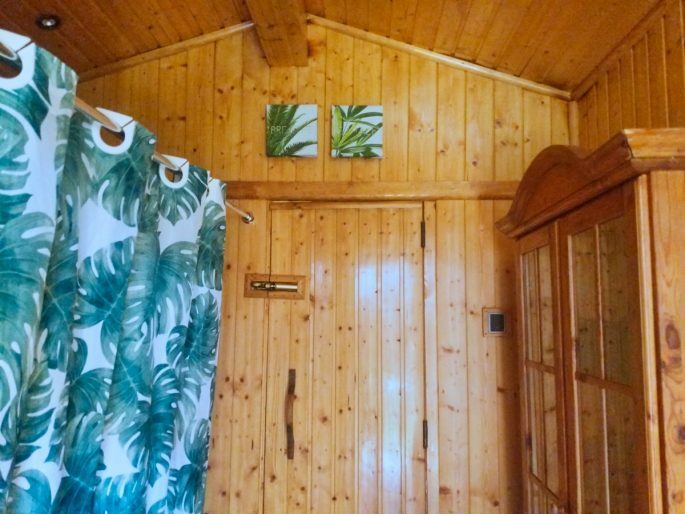 There are some twin rooms but if I’ve ever seen a situation where sharing a room isn’t ideal, this is it: if you can book a single room with your own bathroom, it will be well worth it. 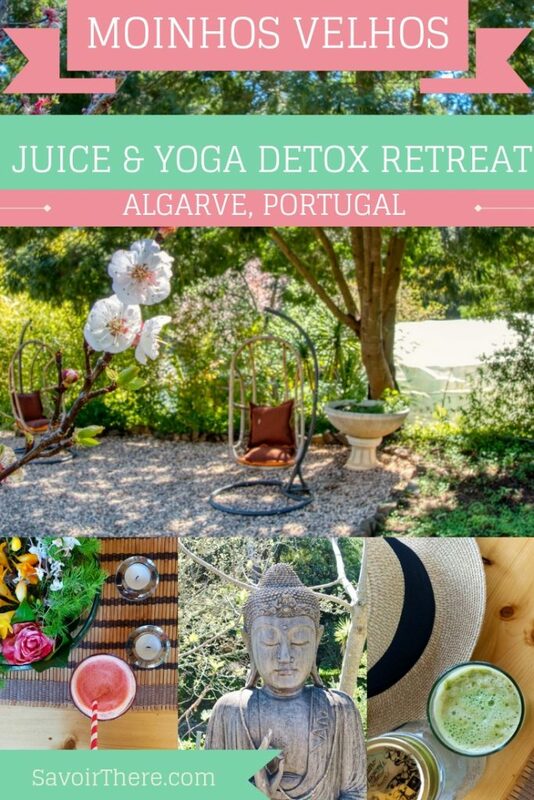 This juice detox retreat is in Portugal’s Algarve, near the city of Lagos, yet far enough away to be set in a tranquil and secluded location, with absolutely no temptation within walking distance. 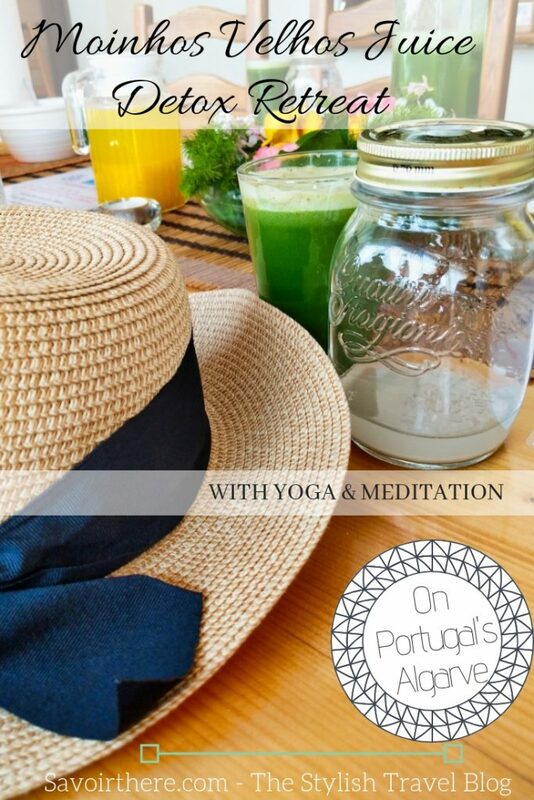 I took the 2.5 hour flight from London to Faro (I recommend British Airways for a pleasant journey), and was picked up at the airport and transported painlessly to Moinhos Velhos in under an hour, ready to begin my juice retreat. 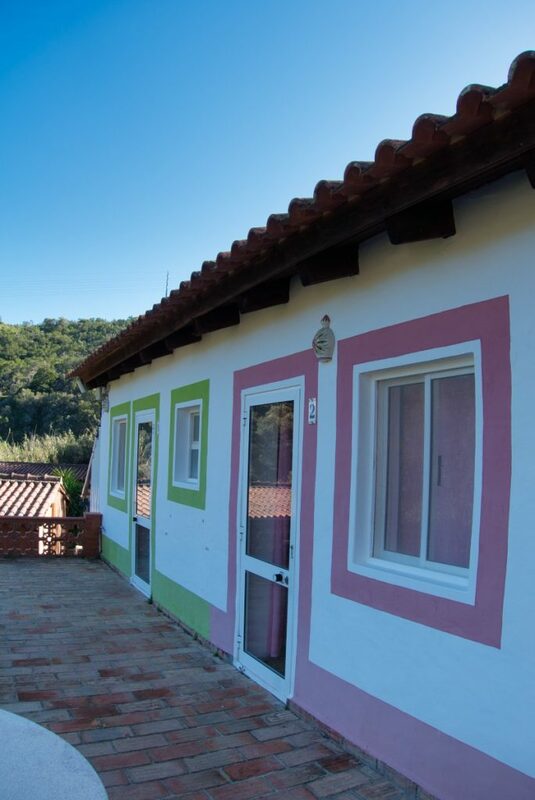 You can find out more and book direct, by visiting the Moinhos Velhos website. 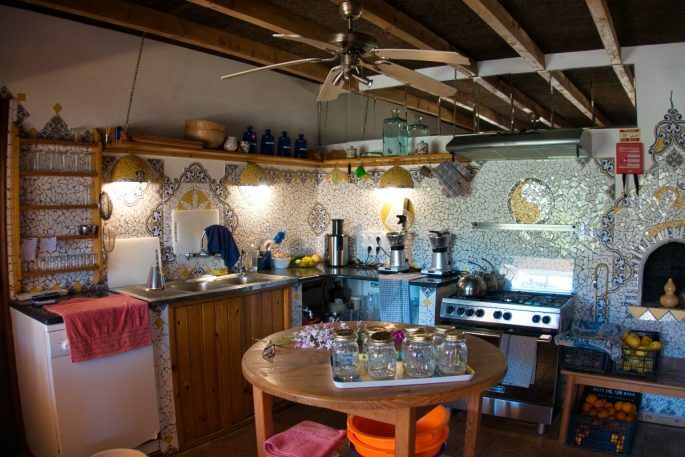 Have you ever been on a juice retreat like this or would you like to try one? Feel free to let me know in the comments, or ask any questions you may have! Savoirthere was a guest of Moinhos Velhos, but all opinions are honestly shared.